Shirts With Random Triangles: Louisiana-Lafayette adds 3-star WR prospect Peter LeBlanc to its 2019 recruiting class. 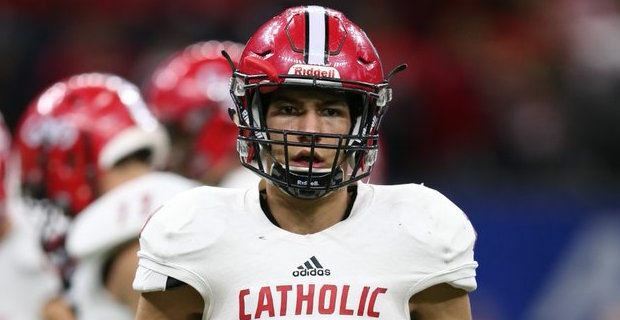 Louisiana-Lafayette adds 3-star WR prospect Peter LeBlanc to its 2019 recruiting class. Peter LeBlanc. Image via 247Sports. Louisiana-Lafayette has addd an eleventh member to its 2019 recruiting class. New Iberia, Louisiana high school rising senior wide reciever Peter LeBlanc announced his commitment to the Ragin’ Cajuns on Monday. LeBlanc cited family ties to the school as one of the reasons why he chose Louisiana-Lafayette. He had one grandfather who played football at the school, while his other grandfather ran track. 247Sports grades LeBlanc as a three-star wide reciever prospect. The recruiting site’s prospect rankings for 2019 rank LeBlanc at no 147 among WR prospects, at no. 50 among prospects from the state of Louisiana, and at no. 1245 nationally. LeBlanc attends Catholic High School in New Iberia, La. He stands 6’2, and weighs 170 lbs.